In many ways, choosing a spot for your ceremony and reception is the toughest part of the wedding planning process. Fortunately, there are hundreds of incredible wedding venues in the Denver Metro Area for every type of event. There are dozens of outdoor venues that take advantage of Colorado&apos;s incomparable natural attractions. Or, explore the city&apos;s many grand ballrooms, with stunning mountain views and incredible service. Basically, in Denver, the sky&apos;s the limit. Check out the easy-to-use event facilities guide for the full list of venue spaces. 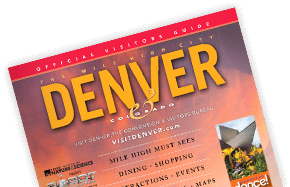 Or, email our in-house wedding expert at tourism@visitdenver.com for help. Denver itself is one of the best reasons to have your wedding here. It&apos;s packed with one-of-a-kind attractions, dining & nightlife options, family-friendly activities and much more. Family and friends coming in town to celebrate your big day need to be kept busy, so you&apos;ll love our list of itineraries, guaranteed to help find something fun for everyone to do while they&apos;re here. You can also check out the official Denver events website Denver365.com for info on what else is going on in the city the week of the wedding. Beyond Denver you&apos;ll find the city&apos;s big backyard, highlighted by the gorgeous Rocky Mountain Front Range. For guests who are coming to help you celebrate from out of state, it&apos;s the perfect opportunity to extend their trip into an unforgettable vacation, or a romantic mountain getaway. National Parks, skiing, unique attractions, outdoor adventure - it&apos;s all waiting in Colorful Colorado. Photographers, caterers, wedding planners, entertainment, videographers and chauffeurs- all are an integral part of the planning process. And Denver&apos;s got an abundance of all of them. These wedding professionals help ensure that your big day is as flawless as it should be. Check out our Wedding Services Guide for a comprehensive list of vendors. Denver&apos;s reputation as a foodie paradise is growing, and that means that you can treat your guests to the best food the city has to offer. Mile High City chefs are doing great things with locally grown ingredients, creating delectable dishes that will wow your guests. Once again, VISIT DENVER can put you in touch with a wide variety of caterers who are guaranteed to make the culinary aspect of your reception absolutely perfect. Denver is an easy city to get to, thanks to the state-of-the-art Denver International Airport (DEN). It&apos;s the sixth busiest airport in the nation (the 19th busiest airport in the world) and offers non-stops to more than 175 worldwide destinations. DEN is served by 26 airlines, including five low-cost carriers and is a hub for two airlines - United and Frontier. Glitzy luxury suites, funky downtown hotels, intimate B&Bs and budget-priced lodgings - Denver&apos;s got every type of accommodation. Fill out the hotel accommodations form and we can also help you by securing the best rate on a hotel room block for your guests. Instead of you spending hours calling dozens of hotels, we can send your needs out and get you the best price. It may not be the norm to have your honeymoon in the same city you get married in, but hey, why not? From sweeping mountain views to old-world luxury, the honeymoon suite is all about indulgence (and room service, of course). Of course if you&apos;ve got your heart set on a more tropical honeymoon, there&apos;s always your first anniversary ... Check out a rundown of some of the most romantic rooms in Denver. Ready to start? Follow these 10 steps to planning your Denver Wedding!